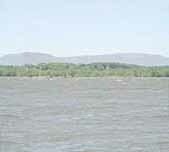 Wading staffs are normally used to help anglers negotiate deep and/or fast flowing water. I fish for wild trout and grayling on the River Rye near my home and even in quite shallow water (knee-deep) I find the wading staff a great help because I can 'feel' my way forward while keeping my eyes fixed on the fly or rising fish. The staff has a rubber ferrule on the bottom which allows me to probe in front without scaring fish - like a metal one might - the loud tapping noise from a metal ferrule can travel quite a distance in water. A detachable cord clips on to the stick when I am in the water and passes round my shoulders so the staff is always with me and doesn't float away if I let go of it in midstream! The length of a Wading Staff is normally said to be around shoulder-height as it is more useful for probing deep water and for climbing and descending steep banks. Since I started using one regularly myself I have found this extra length to be more of a hindrance than a help! My own staff is now a normal chest height. I also adjust the shoulder cord so that the handle of the staff hangs just below my left hip. Every time I put my left hand down I know it will land on the handle and I don't have to search for the cord to wind in the staff. Using my wading staff is now a joy, rather than a chore! As these are normally made to order (so I get the exact measurement and any extras you require) there is a waiting time of around four to six months. If we are less busy I may be able to make one sooner but please don't rely on that - order with plenty of warning if you can! Two popular handle shapes are available as standard. Wading staffs are handmade to order. Waiting time around four/six months at present. 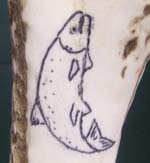 Make your wading staff even more special by having a salmon engraved (by hand) into the antler, which is first polished to a white background. The engraving is stained black to make it stand out. 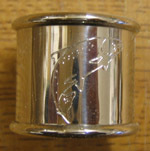 Alternatively you may prefer a nickel silver collar engraved with a salmon (on two sides). 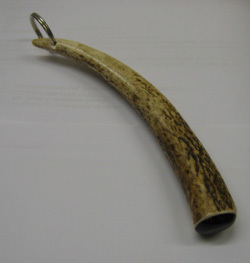 The collar is fitted covering the joint between the handle and the shank and can be engraved with a name or initials. Includes weighted end, rubber ferrule and detachable shoulder lanyard. If you have entered letters for engraving MAKE SURE you have also ticked the box for the "Fit engraved salmon collar". The bottom end is weighted with lead (covered in plastic) to help it sink and to make it hang low in the water so that the fishing line is less likely to tangle round it when using a fly line. 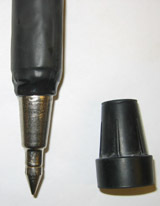 A Heavy Duty rubber ferrule is fitted as standard. If you prefer to have a steel spike fitted INSTEAD of the standard rubber ferrule, you must tick the "steel spike" check box above. You can ALSO order a rubber ferrule to slip over the spike when a softer tip is required. Mind you don't stick the spike through your waders! If you prefer to make your own sticks, take a look at the Wading Staff Kit on the DIY pages - all the bits you need to convert your own stick! Polished Staghorn filled with lead and capped with black buffalo horn. Ring for attachment to lanyard or zinger. Do you have waders that leak? Don't bin them - send them to Dave Gordon for expert repairs! Please mention this link - I'm not on commission but he repaired mine and I said I'd put a link here for him!